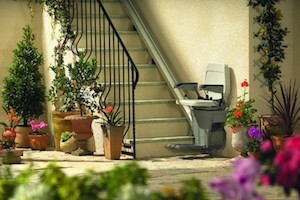 This page includes the latest developments in stairlifts, homelifts, wheelchair lifts, and stairclimbers. 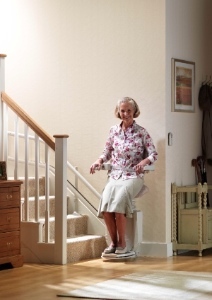 Early stairlifts tended to run on mains electricity, but nowadays, most have integral batteries (DC power), so they are not affected by power cuts. Automatic recharging while the lift is parked at the top or bottom of the staircase will ensure that power doesn’t run out in mid-ascent. With no external moving parts, and a failsafe braking system which ensures that the lift can’t descend in an uncontrolled way, outdoor stairlifts are available with remote control or joystick operation. 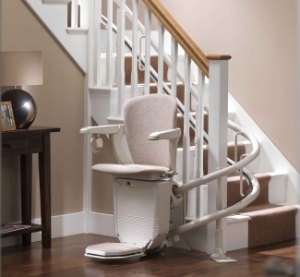 Stairlifts are fitted with many safety features, to ensure that you can use them with confidence. For example, pressure sensors ensure that the lift stops if any obstacle is encountered. 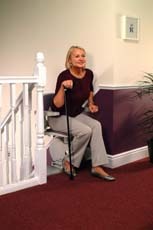 A seat that swivels when you reach the top of the stairs is another popular safety feature (left), allowing you to alight from the lift well away from the edge of the staircase. If you find small controls difficult to manage, consider a lift with ergonomic controls, that respond to a simple nudge. 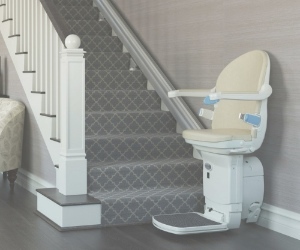 Stairlift seats and footrests may be linked, so that pushing the seat up out of the way when it is not being used, does the same for the footrest – no bending down required. Many people find it hard to move from sitting to standing, and vice versa. Arthritis and other conditions that cause stiffness and pain in the hips or knees may make a traditional seated lift difficult to use. The saddle seat design shown here makes it much easier to get up and down, with less flexing of knees or hips required. 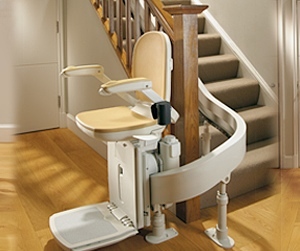 An alternative solution, which is also effective where the staircase is particularly narrow and space is limited, could be a ‘Stand and Perch’ stairlift. One development that has taken off in recent years is the home lift, a domestic version of the elevator we are familiar with in public buildings. 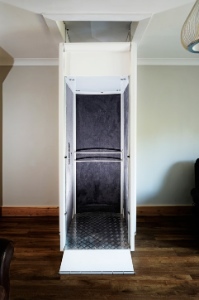 The new generation of lifts for the home has been developed so that they can be installed with minimal disruption to the fabric of the building, speeding up the process, and making it less expensive. 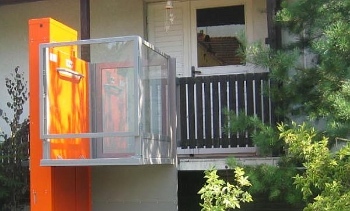 The lifts can be customised to fit in with the look of the home, and models are available that can carry two people at a time, or one person with a laundry basket, or pet dog, etc. With battery backup in case of power failure, like their stairlift cousins, and easy-to-use controls, homelifts are increasingly considered as a practical way of future-proofing the home. 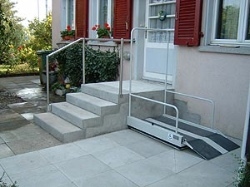 There are also step lifts and platform lifts which enable wheelchairs to negotiate external steps – ramping is sometimes not feasible due to the length required in order to achieve the recommended gradient. 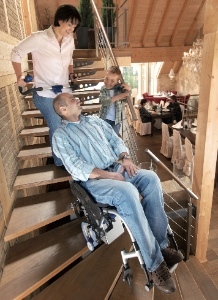 Use this form to send an email about Stairlifts, Homelifts and Other Stair Climbing Solutions to Independent Living. Your contact details will be held securely, so that we can reply to you and deal with your query.